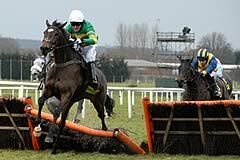 Trainer Philip Hobbs and jockey Richard Johnson teamed up to make the best possible start to the 2010 Festival at Cheltenham when taking the opening Spinal Research Supreme Novices’ Hurdle with Menorah. The five-year-old had suffered a surprise defeat on his previous outing at Ascot but bounced back to hold off the fast-finishing Get Me Out Of Here by a head. “I said beforehand that if we had one winner this week I’d be delighted and we’ve got out of trouble at the first. It’s an enormous relief, that’s the main feeling. We’re out of trouble and hopefully we might find some more winners now,” said Hobbs. “Richard said that he made a mistake at the third last but he gained ground despite that and then two out he was a bit green but Richard poached the lead. We might have been in trouble if he hadn’t done that and it was a really good ride. “He could have gone for a handicap but I thought why not come here, you can’t be afraid of one horse (favourite Dunguib). “He’s been beaten twice before but both time they were muddling races and this was strongly-run, which suited him. 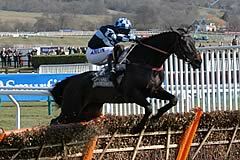 Johnson added: “It was a farcical race last time at Ascot but he’s a very, very good horse. I’ve always thought a lot of him and he’s never properly had a race run to suit him until today. It was a true-run race. “He only ran in a bumper eight months ago so there’s a lot of reason to believe that he’s going to improve a lot. He won a two and a half mile bumper and I always thought he would stay well but you never know up that hill. Menorah’s owner Diana Whateley, from Worcester, said after her horse won the opening race of the 2010 Festival: “I am completely overcome, thrilled, delighted and ecstatic. We did not think we had much chance of winning with Dunguib running but Menorah has done it. “We bought the horse through Aiden Murphy, bloodstock agent, and Philip Hobbs is our trainer, whom we have a few horses with. “They have always been a fantastic team and we had great excitement about him though he did not run well when we were at Ascot but today is just phenomenal. Winning jockey Richard Johnson said: “On a couple of days this season things didn't work out for Menorah, but they have today and it is a great day for it to happen. He got beat last time because it was a very false-run race. Trainer Jonjo O’Neill and owner J P McManus were making no excuses after Get Me Out Of Here finished a head second in the Festival’s opening race. O’Neill said: “It was a great race and we have no hard luck stories. I wish the winner was mine. He ran well and Dunguib [favourite, finished third] ran well so there are no excuses. “When you are beaten a head you cannot say the Newbury race [the totesport Trophy] left its mark. He came here in tip-top form so we’re thrilled to bits. His preparation was spot on - he had a few cuts at Newbury and bled a lot [from a leg gash] son the day, but we cleaned it all out and he was going to have a few easy days after that in any case so it made no difference to him. “We’ll have a look at Liverpool now, but we’ll see how the horse comes out of this race. He’s done us proud and we don’t want to abuse him. Dunguib, considered the Irish banker for The Festival by many people, could fare no better than third in the opening Spinal Research Supreme Novices’ Hurdle, just under two lengths behind the winner Menorah. Settled towards the rear by jockey Brian O’Connell, the 4/5 favourite still had plenty to do as the field approached the third last. Although the seven-year-old made up a significant amount of ground in the straight, he was unable to reach Menorah and Get Me Out Of Here. Trainer Philip Fenton was philosophical in defeat, stating: “We are satisfied with his performance although it’s obviously disappointing we are not in the number one spot. “He has come back in one piece and seems fine - that’s the main thing. We live to fight another day. When asked if any blame could be attributed to Brian O’Connell’s ride, Fenton responded: “These things happen in a split second and I wouldn’t criticise Brian. “We are still in the winner’s circle here at Cheltenham.